Mercedes-Benz showcasing a first generation G-Wagen frozen in amber may have just been a marketing ploy to promote their tie-in with the rebooted Jurassic Park film franchise, but it served as an apt if unintentional metaphor for the vehicle. This has been a car frozen in time, with a body virtually unchanged since the 1970s when it was meant for military use. Tonight, they unveiled more of the same with the 2019 Mercedes G-Class, but also something much much better. The most recent version of this car was a marvelous and sparkly monster. And I say that with love and no small amount of awe. While most automakers are focused on EVs and grocery-hauling CUVs, the G-Wagen is still a study in extravagance. It doesn’t look new but it is. The new G uses some structural elements from the old car but the rest is largely new, including a new independent suspension with double-wishbone front axle, nine-speed automatic gearbox and new transfer case. 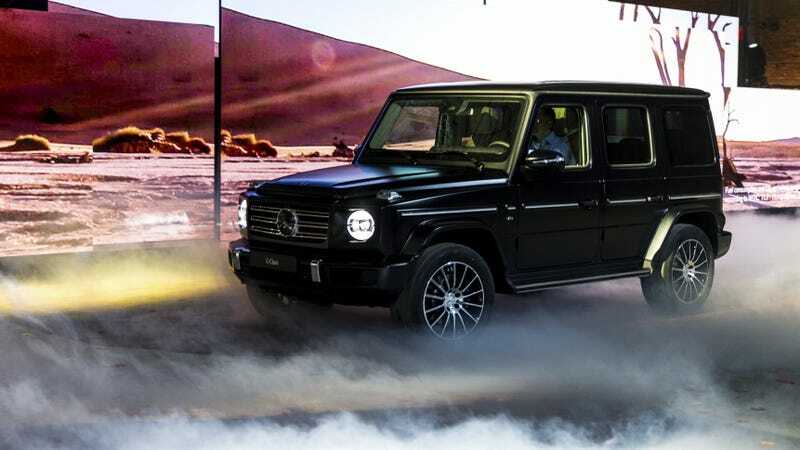 The new Geländewagen is 170 kilograms (roughly 154 pounds) lighter, still has 100-percent differential locks, and Mercedes claims it’s still prepared for true off-roading, probably for when the rich will have to run to the hills the next time there’s a nuclear scare. The good news is the satisfying door locks, with their trademark solid sturdy clunks, are just about the only thing that truly carries over directly from the previous Wagen. The iconic lunchbox-shaped SUV has been due for an upgrade for years now. And while the 2019 iteration keeps its instantly familiar right angles, the interior is a vast improvement, providing the cushiness and advanced technology buyers have come to expect from a six figure Mercedes-Benz. Benz even says the G-Wagen will eventually become electric. Much like the 2018 Jeep Wrangler, this new Geländewagen is about sanding the edges, not carving a graven image of a classic. Speaking of a graven image of a classic, Arnold Schwarzenegger was there in a cowboy hat because of course he was. This new G also has what Mercedes has creatively dubbed a “G-Mode,” which is a driving mode you can activate when one of the three differential locks activates or the low-range off-road reduction gear engages. Then, the chassis, steering and accelerator all help to maximize the SUV’s off-roadiness. Mercedes has given the G550 a twin-turbocharged 4.0-liter V8, good for 416 horsepower and 450 lb-ft of torque. The new Wagen will go on sale in the U.S. by late 2018, though no price has yet been revealed. We also don’t know what the AMG version will be like, but probably faster, more powerful and more expensive.